Make These : Easiest Black Bean Tacos Ever. I am obsessed with this ‘I can’t believe it’s not a real recipe’ for black bean tacos. I don’t really like beans but I adore black beans and in this recipe they make the perfect ground beef replacement. This recipe I just kind of made up, it makes about 6 tacos which serves 2 hungry adults. 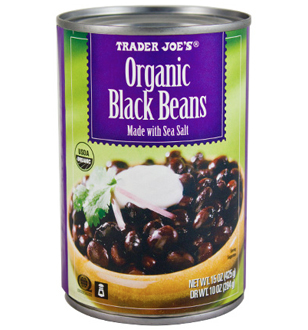 I get all my supplies for this recipe from Trader Joe’s because they have organic taco shells and organic black beans at really great prices and their taco seasoning mix is spicy which I love and their salsa is chunky. For well under $10 you can have this amazingly healthy and tasty dinner in about 15 minutes. Open salsa and drain out excess liquid, add to beans in the pot. Open taco seasoning mix, use about .5 the package, mix into pot then adjust to your taste preference. Toast the taco shells for 2 minutes in an oven set to 350. Remove taco shells, fill with the goodness and then enjoy the easiest black bean tacos ever. 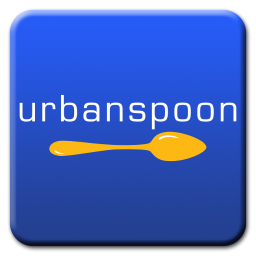 Categories Nutrition., Vegetarian and Vegan Grub and Transition Foods., Vegetarian and Vegan Recipes. Trader Ming’s Ginger Peanut Noodle Salad. 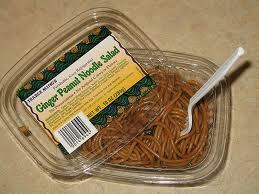 While shopping at Trader Joe’s last week, I came across a ready-to-eat meal of Ginger Peanut Noodle Salad. Being that I am obsessed with all noodles in the sesame, ginger and peanut realm, I knew this would be right down my alley. It’s a very simple and basic recipe, it’s just some spaghetti with soy sauce, rice vinegar and peanuts, it’s a bit high in sodium because of the soy sauce, other than that there is no salt added. These noodles can either be eaten cold or warm, I opted to keep them cold cuz I think these types of noodles are better cold. They always seem more flavorful, but that could just be me. So if you read this blog on the reg you know by now I have a bit of a sweet tooth and I don’t ever deny it what it wants. I have learned my lesson many times. You all know what I’m talking about, don’t act like I’m crazy lol. Those times when all you want is a candy bar or some dang Swedish Fish but you try to be all ‘healthy’ and eat some prunes or maybe an orange to satisfy the sweet tooth. Then it fails and you end up eating mad fruit, then maybe some random chocolate chips and yet a half hour later you still find yourself walking to the nearest Bodega to cop some Swedish Fish? Don’t tell me I am the only one???? Lol. That dilemma above is why I love this new Trader Joe’s find so much. 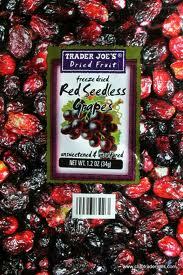 Freeze dried red seedless grapes. They are my new addiction, my new candy, my new love. I mean I cannot get over these things. They are like these candy coated balls of goodness yet all it is are freeze dried red grapes. Its amazing what freeze drying does to grapes, I have never seen anything like it before. So delicious. You MUST try them if you like candy. If you don’t like candy then you may want to pass these up and get that checked out 😉 Since this is 6oz of real fruit, it can be counted towards your daily needs. And we have a winner. Categories Nutrition., Vegetarian and Vegan Grub and Transition Foods. 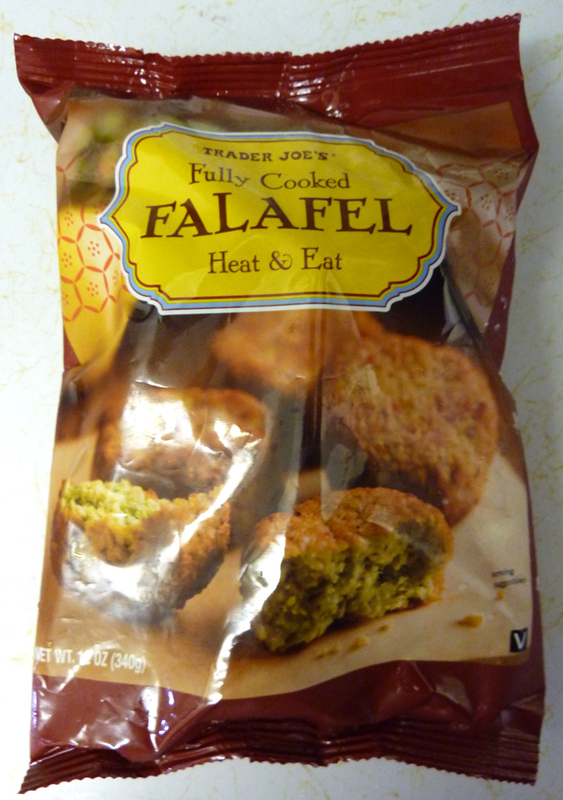 Anyways when it comes to frozen falafel Trader Joe’s wins, there is just something about the taste and texture of these little bundles of joy. They are very hearty and filling but that did not stop me from eating 5 the other night. The serving size is 3 and in that you get 300 calories, 6 grams of fiber, 8 grams of protein and a decent amount of vitamin c, iron and vitamin a. These particular falafel are all natural with no preservatives, vegan and cook up easily in the oven in 15 minutes. You can also microwave them in under 3 minutes for a super fast lunch or dinner. 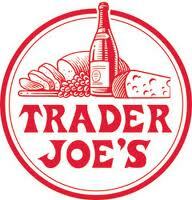 Look for them at Trader Joe’s in the frozen foods section next time you are swinging through. Added bonus is they are only like $4.00. 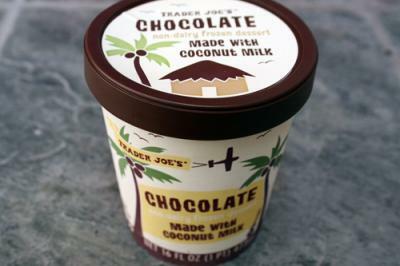 Trader Joe’s Non-Dairy Frozen Dessert. Made from all natural ingredients this Non-Dairy Frozen Dessert is pint sized, made from coconut milk and delivers everything you want from your ‘ice cream’ and then some. I bought the chocolate on but I also saw a strawberries and cream one there. If it is anything like the chocolate then my waist line and hips are in t.r.o.u.b.l.e. I have zero self control with frozen confections like these. 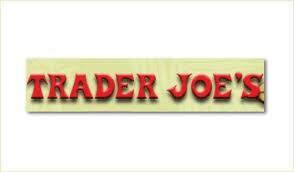 Trader Joe’s Vegetable Masala Burger. Although low in protein and fiber, 2 and 1 grams respectively, once you add a deli flat and some greens and whatever else you plan to top it with, you are sitting in a much better position nutritionally. There are only 120 calories per burger and 4 come in one box. This is not a ‘mock meat’ product, this is something both veg heads and carnies will enjoy. I am not a huge fan of Indian food but I do like a few dishes and this burger just happens to catch the essence of them all . 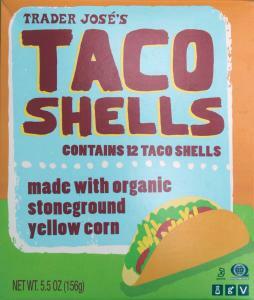 Next time you are swinging through T.J’s pick of a box of these in the frozen foods section. They are the perfect mid-week, lazy dinner meal, they can be shoved in a pita or chopped on a salad. They have so much flavor I am sure they would even do fine on their own. 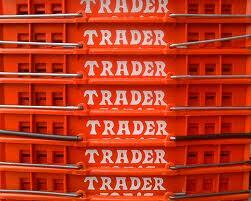 Recently at Trader Joes I had been seeing these citrus type fruits for .69 cents each. They were labeled as ‘Minneloa’s’ so I assumed they were just some new fancy hybrid. 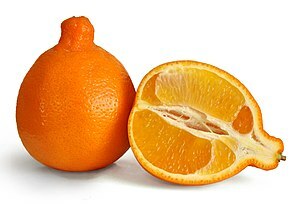 Turns out I was wrong and Minneloa is just a type of Tangelo, which is something that I have heard of before. Needless to say, these Tangelos have been amazing and I am now obsessed. Now besides tasting delicious, Tangelos are also quite good for you. In only 70 calories per piece, you get 2 grams of fiber, 1 gram of protein, 100% of your daily Vitamin C needs and 80% of your daily Folate needs. These citrus guys are also no slouch when it comes to Potassium, Magnesium, Vitamins B6 and A. So next time you are grocery shopping keep an eye open for Tangelos because to put it simply, they are the ish.